In cerdd dant there are five established and warranted tunings, ‘Y pum cywair safedig a gwarantedig’. The table below gives the tunings, cyweiriau, using the same convention as Robert ap Huw i.e. starting from ‘g1’, gamwth or Gamma ut (see Robert ap Huw’s p. 108 below). This note is written with the capital Gamma of the Greek alphabet in the following chart. the five established and warranted tunings. Page 108, Robert ap Huw MS, showing cyweiriau, tunings. , G, – c, C, – D, d.
The open strings of the crwth are tuned to the fixed strings, cyweirdannau. The movable strings or notes, lleddfdannau are produced by stopping the strings against the fingerboard. Gamma ut, sometimes called ‘y cyweirdant’ or ‘the principal string’, and G, its octave, are often common to both ‘I’s and ‘O’s. 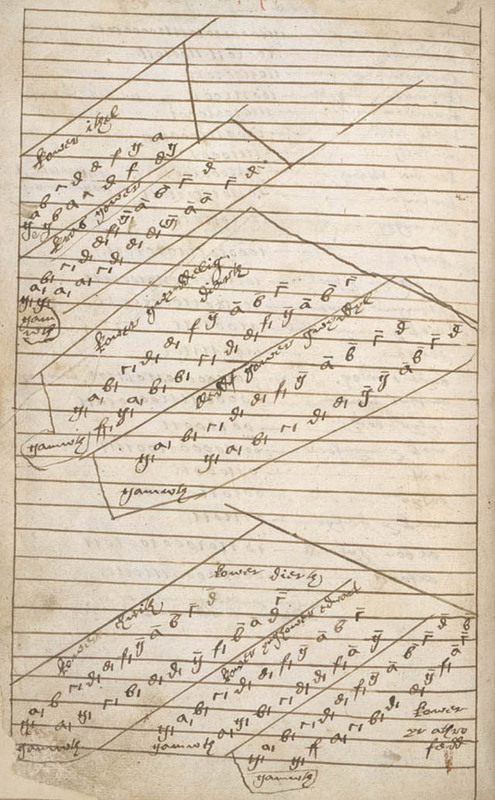 Robert ap Huw’s manuscript gives charts showing many other possible tunings (p. 108). Bragod tunes the crwth to give pure, Pythagorean 12 : 8 fifths, 12 : 9 fourths and 9 : 8 tones. The arrangement of the strings in octave-pairs means that when a fourth occurs in the music, it is converted into a fifth, considered a more consonant interval. The octave-pairs create octave-ambiguity and also ambiguity between fourths and fifths, thirds and sixths, tones and sevenths, etc. The tone of the bray-harp, used in Wales from the late-14th century to the early-19th century, also creates ambiguities of octave and interval. Like the organ, the crwth readily produces subtle acoustic phenomena, such as difference tones, which allow the listener to hear much lower and higher pitches than are being sounded on the instrument. The octave-pairs of strings encourage rich overtones. Tuning and playing perfect intervals generates a kind of ‘purring’ or ‘sizzling’ in the crwth which makes the instrument ring. When the crwth is joined by the human voice the tonal landscape is transformed, not only by the singer’s changing pitches, but by small changes in vowel-colour. The strings are far enough apart on the finger-board to allow them to be stopped separately i.e. to be played other than in octaves if required.